If there is one thing we know by now it’s that the more time we spend on the Nyimili range, the more spectacular it proves to be! 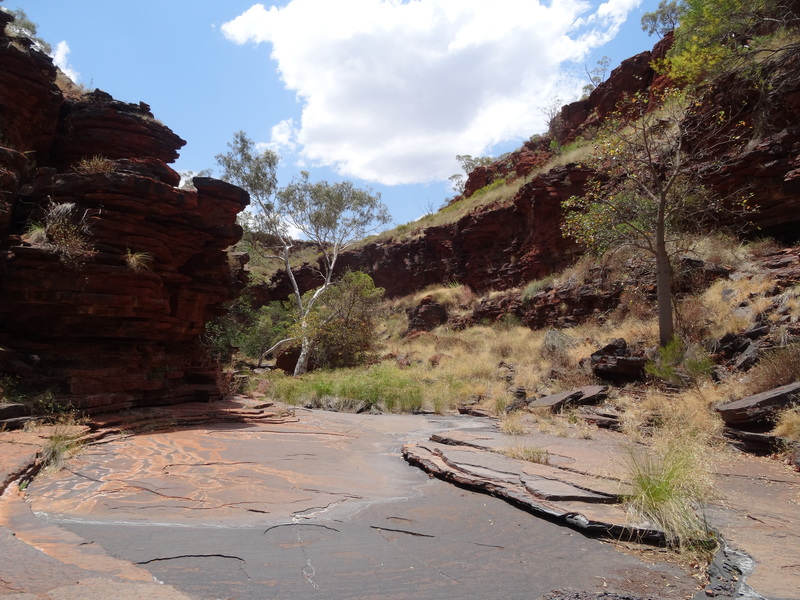 Following on from findings such as ochre paintings, engravings and wooden artefacts the team went on to identify numerous more scarred trees and rockshelters with cultural materials in them. Camping out under the stars allowed us to get an early morning start to explore another entrance to one of the gorges within the range. After come climbing on the hot rocks and slashing through thick vegetation the team found an alternative way to enter the heart of the range. Within the range we came upon a lovely cool spring which was a welcome relief to the pressing heat. As the archaeological record of the range grows with each day the team spends on the ground, so does the richness of the ethnography. By now the team has gathered the stories of people born and buried around the range, where they may have camped along and inside the range, as well as the resources they would have collected. With bush fruits, bush tobacco, and bush medicines all readily available it is a prime location to make camp for a good part of the year. With one more trip planned for the year, we can’t wait to head out again!